Milling machines come in sizes ranging from small to those requiring warehouse space to operate. Using a wide range of tools, milling machines carve and drill into raw products to create shapes and nearly finished products. They can drill holes, add threads for bolts or make precise shapes out of any solid material. Older machines relied on the machinist for precision. Modern machines are controlled by computers to make very precise parts. down on the “Z” axis and the tools are spun by a motor. The motor is either a variable-speed motor, or a system of pulleys that is used to vary to the speed of the tool. The table moves on two axes, the X and the Y. The table is moved manually by hand-wheels across the X-Y plane to position the material under the head or move it against the cutting tool. A machinist follows a blueprint to make parts or program the computer. By selecting tools and performing various operations, he machines a blank piece of material into a precision part within the tolerances allowed. Precision operations with tolerances of .005 inches are common, while .0001 or .0002 inches are also possible. 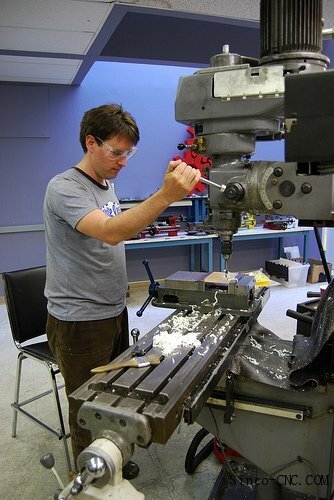 Knowing which tools will best perform each task is a large part of being a good machinist. A computer numerically controlled mill, or CNC Mill, makes precise or production parts with little intervention by the operator. Precise measuring instruments and special motors called stepping motors move the head and the table, select tools and machine the parts to precise dimensions that are difficult or too time consuming to do manually.